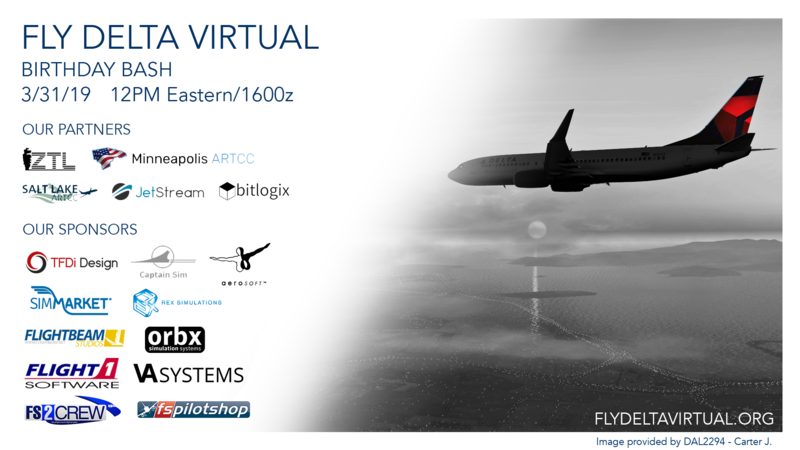 Fly Delta Virtual will be celebrating our one year anniversary with a day of great flying, great prizes, and great friendship. Help us celebrate our big day on March 31st as we embark on a two leg trip to three of Delta’s biggest hubs. Our Western Hubs (KSLC, KSEA, KLAX and KMSP) will fly KSLC to KMSP to KATL, while our Eastern Hubs (KDTW, KBOS, KJFK, KLGA, KATL) will be flying westbound from KATL to KMSP to KSLC. The event will begin at high noon, eastern time, on Sunday, March 31st. If you are interested in the prize draw, we have secured over $1000 in prizes to give away. In order to enter for a chance to win one of these prizes, and to receive more information, please visit our event page at https://flydeltavirtual.org/birthday to sign up, as well to reserve your spot.